Send overnight mail as a web-based mailer that allows you to send all your mails without necessarily leaving your desk. The web app is suitable for use in people of all professionals. Whether you are a contractor and wants to send an invoice, a lawyer forwarding documents to the court or his clients or a doctor who wishes to apply for a license, you can rely on the app in midst of your tight schedule. Send Overnight Mail will help you send whatever documents you wish immediately without inconveniencing you. The developers have included features that make the web app reliable and efficient in sending your mail. Document upload- the app gives you an option to upload your documents from any location within your United States. The app accepts various document formats including PDF, invoices, applications, and bills among many others. Multiple delivery options- the site offers you multiple delivery options depending on your needs and budget. Confirmation- Send Overnight Mail puts a tracking number on your envelope to help you track it and know when the recipient has received the mail. Secure payment options- to ensure the security of your card, the app only accepts payment via PayPal or Stripe. As an additional advantage, your credit card information is never saved and hence no chances of compromise. 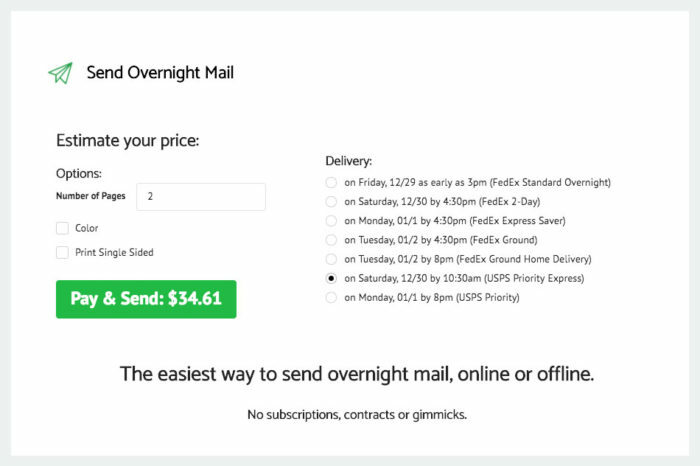 Send Overnight Mail doesn’t require signing up but you instead you visit their website, upload the documents you want to send, and then choose your preferred payment method. In case you have a lot of documents you want to send, you should first contact the customer service through the provided email address or send a direct message on the provided contact and you will be advised on the way forward. Using Stripe on credit cards ensures that you are secure on using your card online. PayPal is also safe for use in case you don’t want to use your credit card. In addition, it offers privacy benefits by ensuring all your mails are deleted from their servers the moment you get confirmation that your mail has been sent. Easy to use- It is easy to use since it doesn’t require you to sign up in order to send a mail. Affordable- It is highly affordable considering you only need to pay for the mail you are sending with no recurring charges. It only costs $1 to send 4 pages and any additional pages will cost you $0.25 per page. User-friendly interface- when you open the Send Overnight Mail app, the first thing you will note is the user-friendly interface. The instructions are straightforward and all you need to do is upload your documents and click send. If you have a huge bunch of mails that you need to send, you need to contact the customer service first which might take time to be advised on the way forward. The app limits you to sending mails within the United States only. Looking at the features and the benefits Send Mail Overnight offers, we can say it is a highly convenient method of sending mail. The web app is a suitable solution when you have urgent mails to send in midst of your tight schedules. After all, has been said, this app is worth trying.